In his 12 seasons as a linebacker for the NFL’s New England Patriots, Andre Tippett initiated a lot of sacks, goal line stands and stalwart defensive efforts. So it doesn’t come as any surprise that he whole-heartedly initiated his conversion process to Judaism before he and his wife Rhonda married in 1993. “I learned a lot from my wife’s upbringing in Judaism and I knew how important it was for her,” said Tippett, a Birmingham native who was enshrined into the Alabama Sports Hall of Fame on May 12. “I knew we were going to get married and wanted to start a family. The ASHOF induction represents Tippett’s trifecta, having been elected into the Pro Football Hall of Fame in 2008 and the National Jewish Sports Hall of Fame in 2009. Tippett’s family moved from Birmingham to the northeast when he was younger and he graduated high school in Newark, N.J. He was recruited by the University of Iowa and led the Hawkeyes’ defense in 1981 to its best performance in school history. The Patriots took notice and drafted him in the second round of the 1982 NFL Draft. He became an instant starter and from 1984-85, Tippett recorded the highest two-season sack total by a linebacker in NFL history with 35 sacks in the two seasons. He would earn five straight Pro Bowl selections from 1984 to 88 and was named AFC Linebacker of the Year for three straight seasons, 1985 to 1987. But something more important happened in 1986 — he met the love of his life. Rhonda Kenney had just graduated from college and was working at a black radio station in Boston. Tippett came in to do an on-air interview and met Rhonda. “He asked me out and we found an instant connection. We dated for seven years and we knew for sure we were meant to be together early on,” she said. Rhonda and Andre got a rabbi friend to marry them in Las Vegas, about the time he retired from the NFL in 1993 after spending his entire 12 years with the Patriots. “For at least a few years prior, Andre would ask me questions about Judaism and learn as much as he could. He was always very passionate about it,” said Rhonda. “It intrigued and engaged me,” he added. In his conversion process, he was aided by Robert Kraft — the Jewish owner of the Patriots and known as one of the top philanthropists for Jewish causes worldwide. Kraft was one of two witnesses at the ceremony. “He is one of the nicest, most incredible people you could ever know. 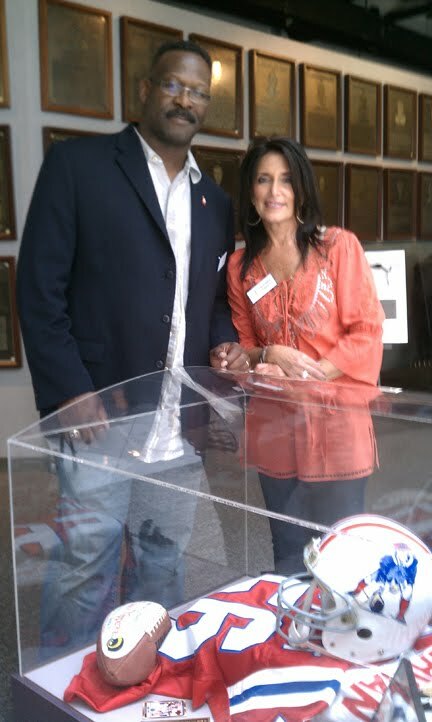 I am so grateful to him and my family for their support,” said Andre Tippett. Kraft is still his boss to this day. Tippett currently serves at the Patriots’ Executive Director of Community Affairs. The Tippetts have three daughters — Janea, Asia and Madison, along with one son, Coby. In 2007, Rhonda went on a mission trip to Israel. In 2009, the entire family went, in part for Madison’s Bat Mitzvah. It was Andre’s first trip to Israel and he said it was “awe-inspiring. It is amazing to experience Israel and Jerusalem. This is where several religions and cultures intersect. There is so much rich tradition there and it is such a beautiful place,” he said. Of course, being a sports hero and being Jewish, Andre is asked to make appearances at a lot of special events hosted by groups in the Jewish community. “I embrace it and enjoy it. I try to attend every Bar/Bat Mitzvah and Temple Brotherhood event I am asked to speak at. It’s always fun to talk about football and being Jewish,” he said.